High quality large 5050 LED flexible strip. 3M self adhesive tape to the rear. There are 60 LEDs per metre with cut points every 5cm. 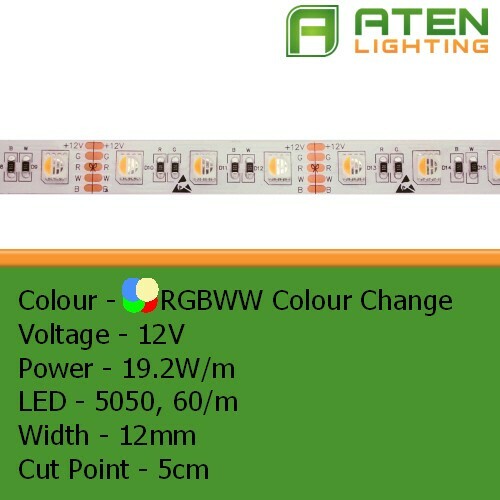 RGBW colour changing via one of our LED controllers. Each 5050 LED has a red, green, blue and warm white chip enclosed within the square LED enabling any number of colours to be selected via an appropriate controller or just warm white light. If purchased with a controller, we will attach the LED strip to the controller unless requested not to. Please see the RGBW controller options in our accessories section or below. 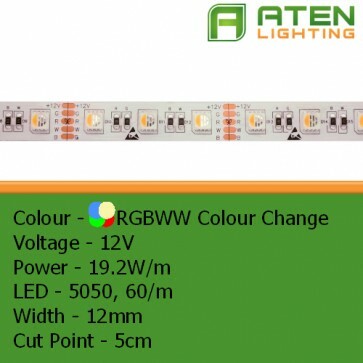 If buying without a controller, the LEDs will be supplied with 15cm of 5 core cable attached for connecting to a suitable 12V RGBW controller. Preset lengths of 0.5m to 5m available online, for other lengths please email or use the contact form.